Half of the fruit was destemmed followed by 48 hours’ skin contact prior to pressing. The remaining fruit, whole bunch pressed to tank at receival. Combined and wild fermented as one batch on full solids, with cool and slow fermentation in a stainless steel tank aiming to preserve the purity of vineyard & fruit flavour. Followed by time on lees for mouthfeel. Bottled on 4th July 2017, 126 dozen produced. A complex and textural style, warm spice, floral notes and nuttiness, surrounded by classic Kuitpo flavours of white pear, green apple with hints of thyme & celery. Minerally acidity, zippy like kiwi fruit with great mouthfeel and structural persistence. Drinking: Ready to drink on release and will improve with age. Cellar 10+ years. K1 Vineyard is owned and farmed by Geoff Hardy in Kuitpo towards the South West end of the Adelaide Hills wine region. Soil: Bright clay with gravel, quartz, ironstone and sandstone. Fermented cool & slow in stainless steel to preserve the purity of the vineyard, followed by time on lees for mouthfeel. Harvested early to preserve the best of this variety. Perfumed and pungent, reminiscent of the Alsatian style. Invokes a feeling of summertime, fresh and bright, bursting with delicate rose petal, fresh lychee and musk. The palate is bone dry with lively acidity leading to a passionfruit twist. Dinking... Drink now while young and fresh, or up to 2022. K1 Vineyard is owned and farmed by Geoff Hardy. Lifted and fragrant with white pear and quince blossom. The nose hinting at warm spice with fresh ginger and a pop of star anise, while the slatey minerality mirrors the cool slopes of Kuitpo. The palate is textural and giving, showing crunchy acidity with a lingering white nectarine and stone fruit finish. Drinking... Enjoy now or cellar to 2025. Our second vintage release, the 2014 Grüner Veltliner has everything we love about 2013, with extra intensity and concentration. Hand-picked and gently whole bunch pressed. 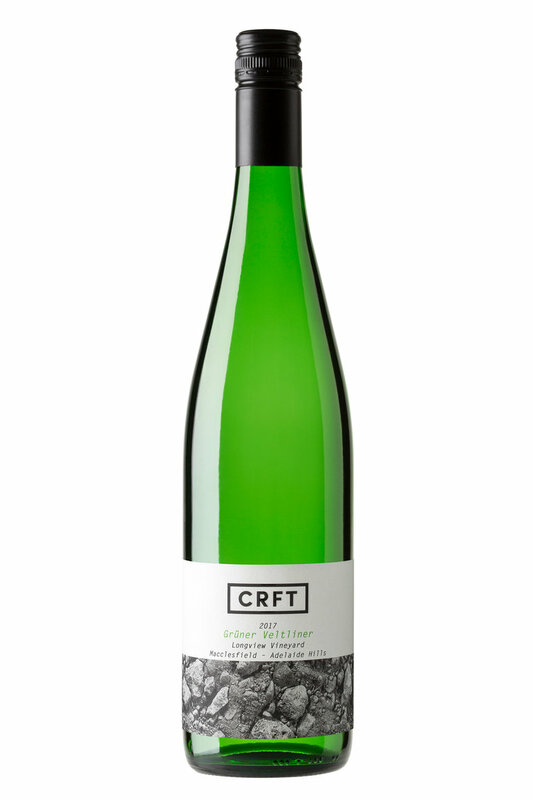 Crafted with minimal additives and fining, all CRFT wines are vegan. This Austrian native is proving to be the superstar white variety of the Adelaide Hills, and without doubt, has found its second home. Distinctively varietal, white pear with lifted hints of dill, celery and rocket. Packed with warm spice, pepper and pretty floral notes.The palate is lively with luscious mouthfeel and tangy acidity. Drinking... Enjoy now or cellar to 2024. This Austrian native is proving to be the superstar variety of the Adelaide Hills, and without doubt, has found its second home. Similar in style to the Austrian classed “Federspiel” Grüner Veltliner. Medium bodied with delicate fruit, peppery notes and a minerally backbone. Delicate white pear and stone fruits together with warm fennel seed spice and white pepper, our Grüner has loads of interest. The palate is all about purity of site, with textural layers, lingering acidity and spice. Food... Grüner Veltliner loves Seafood & Asian cuisine. Pairing with cheese will really bring out the Grüner spice. Drinking... Enjoy now or allow to mature to 2018. Gently pressed and fermented cool & slow in stainless steel to preserve the purity of the vineyard, followed by time on lees for mouthfeel. From the cool slopes of Kuitpo, delicate, bone dry and textural – just how Gewürz should be. Lychee fruit, lemon zest, and Turkish delight, wrapped around hints of fresh ginger and lavender. Pair with food for a whole new dimension and watch the spice pop. Food... A perfect match for spicy dishes, seafood or cheese. Dinking... Drink now while young and fresh, or up to 2021. Harvested early to preserve the best of this variety. Aromatic, punchy nose, reminiscent of the Alsatian style. Bone dry palate with bright acid. Hugely perfumed and bursting from the glass with lychee fruit, Turkish delight and hints of spice. The palate has textural layers with lively acidity. Food... Gewürztraminer loves spicy Asian food. Drinking... Drink now while young and fresh, or watch it develop to 2017.